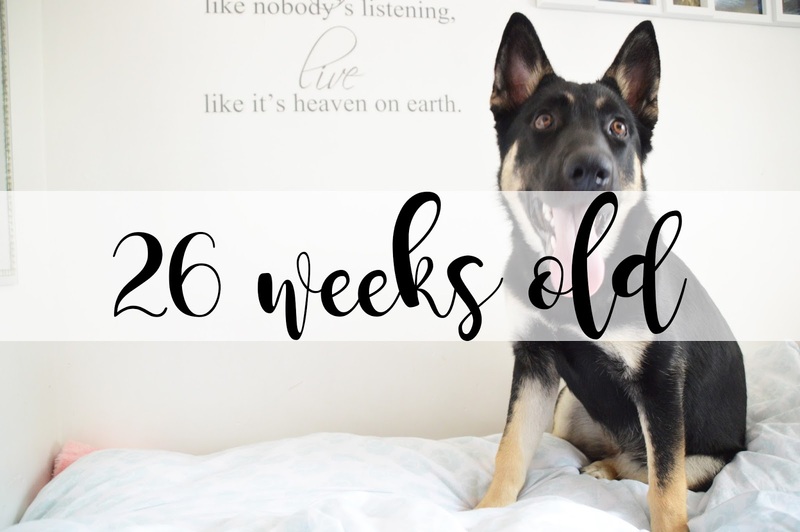 I thought it was about time I shared with you another update on Willow now that she has turned 26 weeks old, how crazy! It doesn't seem like we've had her for that long. I have to say one thing, I absolutely love taking pictures of Willow; she's so blimming photogenic, when she wants to be; it's so easy to get some beautiful shots of her. Last week we even took her to a big fenced off area to take lots of pictures of her running (I got over 100). So Willow is round about 26kg currently. She tends to put on 1kg every single week and thank god, it's in line with how many weeks old she is so it's easy to keep track of and she's getting huge, so so quickly. Something Willow absolutely loves to do is climb onto my lap whilst I'm sat at our kitchen table, and then either climb onto the table to get a cuddle off my mum or to just sleep right in the middle of the table whilst I'm on my laptop. It's like her own bed and she bloody love sit. Something Willow is still struggling with is her fear of people. She has improved so much since she was tiny but it's still not completely there but we're constantly trying with her and getting people to feed her treats so she begins to think "okay, this stranger isn't going to kill me". Willow has also grown a love for towels. No matter where we place a towel in our kitchen to dry our hands, she will find it and she will take it into the garden to either lay with or chew. We can never tell what she's going to do with it until the moment we wake up and find it chewed or not. If you have me on Snapchat or Twitter then you may have seen the video of Willow splashing in a pool of water; that's the Husky in her. She absolutely loves water and tries to dig in it, splashing everything and everyone around her. Our previous German Shepherds never done this so we're assuming it's something about Huskies and that's why she's done it ever since she was 8 weeks old. If you have any questions, let me know! To keep up to date with Willow, you can follow her account on Instagram (@_willowbelle), where I share updates on her. Loved reading this, she is absolutely stunning! So looking forward to reading more about her!